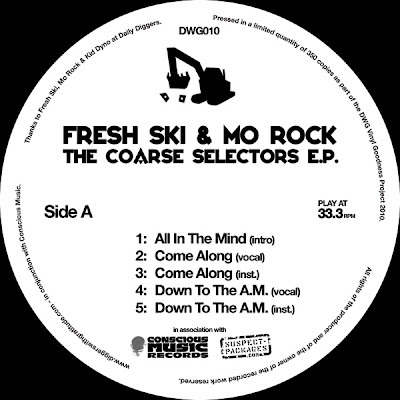 This weekend I will be meeting up with FRESH SKI, MO ROCK, and RAREDAVE from DIGGERS WITH GRATITUDE to discuss the forthcoming DWG release of THE COARSE SELECTORS EP on vinyl. Featuring unreleased tracks from 1988-89 this release will be a classic for the UK crates to accompany the "Talking Pays" 12" and "The Long Awaited Paroxysm" EP. If you love UK Hip Hop that stands the tests of time, then you need to check out THE COARSE SELECTORS. I will also be conducting an interview with FRESH SKI & MO ROCK for a future post on DAILY DIGGERS so stay tuned for that. looking forward to this dropping...bring it! As good as it gets! Good people involved all round and the music... incredible!